Amazon’s Echo Dot is by far the best-selling Alexa speaker of all time. There might not even be a close second. Amazon doesn’t report sales numbers, but the company has confirmed that the Dot tops its list of smart speakers by a wide margin. It’s not exactly a mystery why the Echo Dot is so popular, of course — it’s Amazon’s least expensive Alexa speaker. But if you thought the Dot was a good deal before, wait until you see the deal Amazon is running right now. 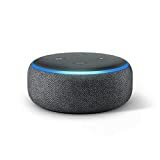 Hurry up and you can snag a $50 3rd-Generation Echo Dot Smart Speaker for just $39.99. It’s the perfect time to add Alexa to every high-traffic room in your house! Our most popular smart speaker – Now with a fabric design and improved speaker for richer and louder sound. Voice control your music – Stream songs from Amazon Music, Apple Music, Spotify, Sirius XM, and others. Bigger, better sound – Pair with a second Echo Dot (3rd gen) for rich, stereo sound. Fill your home with music with compatible Echo devices in different rooms. Ready to help – Ask Alexa to play music, answer questions, read the news, check the weather, set alarms, control compatible smart home devices, and more. Connect with others – Call almost anyone hands-free. Instantly drop in on other rooms in your home or make an announcement to every room with a compatible Echo device. Use another speaker – Connect to your own speakers over Bluetooth or with a 3.5 mm audio cable. Alexa has skills – With 50,000+ skills, Alexa is always getting smarter and adding new skills like tracking fitness, playing games, and more.